Wow. Not sure it's practical in the city, though. With all that downward thrust, surely those people under it would be blown down? isn't that a flying games console. dropped by a kid into a lego town? I wouldn't want to be living in one of those buildings. That looks *really* noisy. Looks absolutely nauseating to ride on. The whole thing would have a wretched smell from all the people it made sick with its incessant wobbling. 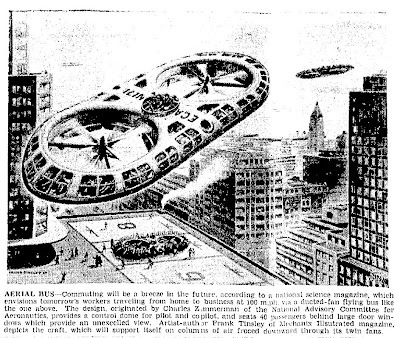 I would echo the comments about the danger and noise of its giant whirling blades. This thing never had a chance. It reminds me of the V-20 osprey, I heard that they are making a civil model for commuting purposes.